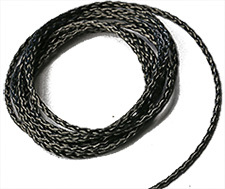 High purity carbon fiber threads specially manufactured for use in carbon evaporators or carbon coating attachments. The carbon fibers have undergone a specific purification heat treatment to remove impurities. The result is a spectroscopically pure carbon fiber (99.95%) with a maximum impurity level of 5-10 ppm which is under the detection limit of EDS and/or WDS systems. The carbon fibers are processed in strands, which makes the threads. The threads are braided into carbon fiber cords. The carbon fiber threads have to be cut in length and attached to the holding post of the evaporator head. 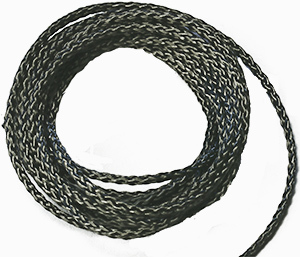 The carbon fiber braids resist unraveling at the ends when they are cut to length. The resulting carbon layer has similar properties as a carbon layer evaporated from carbon rods. However, the thickness of the carbon layer depends on the thickness of the carbon fiber threads. 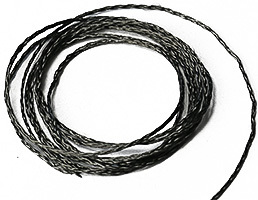 Grade CT7 is a medium carbon fiber thread with a diameter of 1.3mm and a weight of 0.7g/m. Grade CT7 is used for applications where a thinner layer is required when using carbon coaters made by Quorum, Emitec, EMS, SPI, Polaron, Fisons and Technics (Anatech/Hummer). For thicker layers, the carbon fiber threads can also be double or tripled if the power supply in the carbon coater permits this.